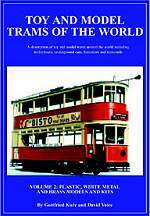 The Society publishes books and booklets on varied aspects of tramways and which, together with books from associated authors, can be purchased here on-line. A "Must Have" for all tramway modellers, at only £19.95. A4, glossy card covers, 148 pages, around 350 photographs, drawings and diagrams. Includes a 1:16 modeller's plan of an open-top "Preston car". Expanding on Peter Hammond's original work "An Introduction to Tramway Modelling", this is the definitive guide for large scale modellers. It contains all the information required to build model tramcars in 3/4" scale, with sections on other large scales (1:24, G etc.). As it has valuable details of the way the real tramcars were constructed, it also is extremely useful to modellers in any scale. To see a review of this book from TLRS's Tramfare magazine: Click here. A 180 page book at £19.95 (new price), over 400 photos, mostly in colour, plus maps and drawings. This fantastic book is not just for the model maker, the tourist will find it of equal interest. It shows you what the railways look like and provides suggestions and all the detail that you need should you be inspired to model them. A fantastic new book on Hong Kong trams, at £27.50. A4, glossy card covers, 216 pages, 500+ colour and b/w photographs, diagrams, scale drawings and maps. TLRS Chairman, John Prentice. and Hong Kong expert Joseph Tse have brought the original 1970s LRTA book by Alan Williams and the late Peter Atkinson up to date. The original is highly regarded as the definitive history of the tramway. The new edition brings it to life with photographs of this vibrant and colourful system. A 12 page booklet at £1.95, mostly in colour, featuring the story of the restoration of Wolverhampton tram 49 at the Black Country Living Museum, plus an explanation of the Lorain surface contact stud system which it originally used, reprinted from Tramfare with additional background material and pictures. A 12 page booklet at £1.95 UK post free, mostly in colour, featuring the story of the restoration of Eades Patent reversible horse car L53 at Heaton Park, plus the history of the development of reversible horse cars and trucks, reprinted from Tramfare with additional background material and pictures. 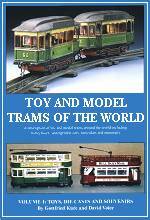 Toy and Model Trams of the World: Volume 1; Toys, Die Casts and Souvenirs by Gottfried Kure and David Voice. Toy and Model Trams of the World: Volume 2; Plastic, White Metal and Brass Models and Kits by Gottfried Kure and David Voice. Order both volumes together and save £10.00 !!! The T.L.R.S. publishes an excellent bi-monthly magazine called Tramfare. The current issue can be purchased on-line for £3.60 UK post free. For back numbers, write to the address below. All Prices include postage to the UK. For a list of TLRS publications, please send an SAE. All Prices include postage to the UK. Cheques (Sterling only) to be made payable to T.L.R.S..